Professional video management made simple. Cinematica manages your growing collection of video files perfectly, with a range of options to suit every need. Now it is easy to organize, categorize, and search your growing video collection. If you have hundreds, or even thousands of video files scattered across	multiple devices, Cinematica is the software you've been waiting for. Whether you are a professional videographer, a drone pilot, or a helmet camera enthusiast, simply drag your videos into Cinematica and watch them organize themselves. 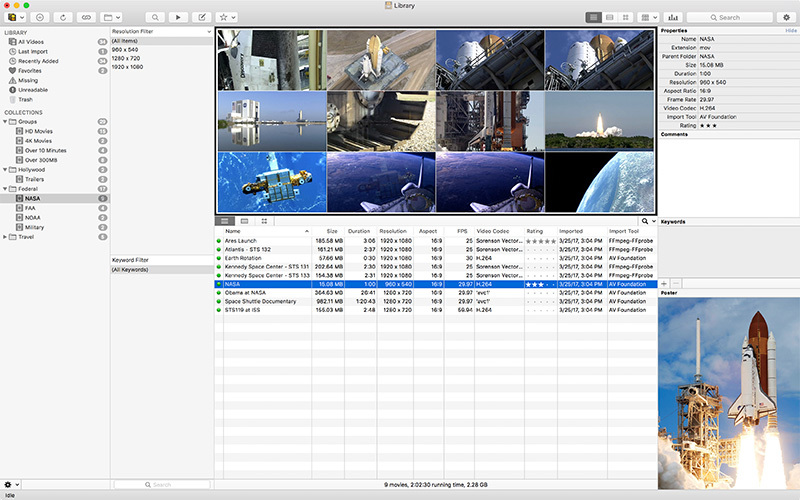 Features such as thumbnails, storyboards, and keywords make cataloging a snap. Taking charge of your video collection has never been easier! Cinematica keeps track of properties for each file. Sort and search by any user-defined field or by technical details like resolution, aspect ratio or codec. Cinematica lets you add keywords and collection icons. Enjoy unlimited user-defined fields and keywords so that organization is a breeze. Cinematica's smart collections catalog your videos into groups, based on multiple criteria. Multiple libraries and storyboards help you find the right file. Finding your videos is simple with Cinematica. Search on multiple fields and keywords simultaneously. Spend your time working, not searching. Cinematica lets you rank videos and sort them into groups in a clean and intuitive way. You'll wonder how you ever lived without it. Simply drag and drop video files and let Cinematica do the rest. Download the free FFMpeg software to extend the video formats that Cinematica can use. Dynamic keyword and property filters let you instantly drill down within each collection to see only those videos meeting specific criteria. Cinematica is able to keep track of your files even when they are moved to a new hard drive. Move files wherever they are needed without worry. When you're ready to watch a video, most video formats can be played right inside Cinematica. It also works with external players like QuickTime or VLC. Cinematica requires macOS 10.11 or newer.